I have a wireless router at point of entry, on a property that has hardwired ethernet. I tried to configure some older wireless routers to appear like they are the same network so that devices wouldn't have to switch networks when moving from zone to zone, but I was unsuccessful and am now looking at buying some new hardware. When I search on "repeater" I get lots of options for wireless-only repeaters, not ones that are hardwired to the source router and replicate the network. I suspect there is a better term for this, but I don't know what it is. Can anyone help me out? What filters should I use on my hardware site of choice, to limit results just to wireless access points/units that can connect to the base station via hardwire, and appear to devices to be the exact same network? I realize my hardware may be too old to do this (easily enough for me to figure out), so that's why I was looking for newer hardware. I'm not jumping on the smart home bandwagon, I'm just looking for a cheap solution so I can quit constantly pulling out my phone to switch to a stronger network when the current connection signal gets too low. Clients cannot switch between routers, you have to set that up in the routers themselves. Essentially, it looks like you want to load balance your network between the routers. I would reccomend having a shared access point that can handle load balancing between the routers that connects to your internal clients, and then the routers NAT the request and send it to a modem. Going to add to this in case I understood the question wrong. If you want to switch to a network with the highest signal, then you need some sort of application on the device that can manage that transfer. I'd reccomend setting up your old router somewhere else in the home as an access point that wirelessly connects to your main router (a signal booster so to speak), and give it its own name (SSID). Then install an app like Wifi Switcher on Android to autmativally switch between the strongest network. The old router will eventually have to connect to the main one either wirelessly or through the walls via ethernet. This answer presumes you have access to the admin page on the DIR-655 and physical access to the device cabling. 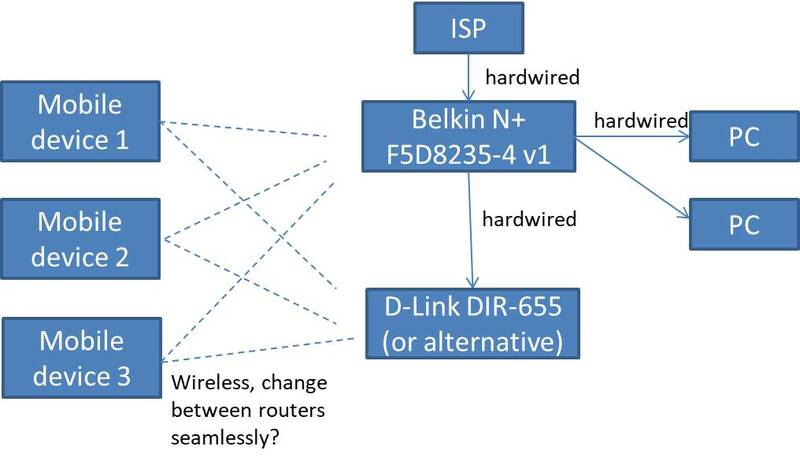 Check and ensure the security settings on the DIR-655 match those on your Belkin router. You will need to test this - I'm basing it on the fact the D-Link will forward the DHCP requests from the clients to the Belkin. If it does not and you can't get an IP address or find your self disconnected then you could configure the D-Link DHCP server to issue address at the higher end of your network - You will need to check at the Belkin is configured to do so you can avoice any address conflicts. This should at a very basic level allow you to 'roam' between the wifi routers as you want. You may have to have a play with the channel settings as well - if they are far enough apart not to interfere they can both be on the same fixed channel. The English product manual can be found here. Not the answer you're looking for? Browse other questions tagged networking wireless-networking router wireless-router or ask your own question. How to Connect Wired Ethernet Devices to a Wireless Network? Playing large video files over wireless network. What technical specification should I look for when buying wireless router? Can I achieve physically connected network speeds between two devices connected to the same wireless bridge? Can a wireless repeater have more devices attached than the wireless router capacity?